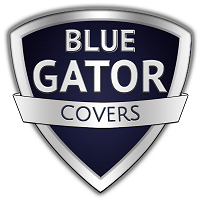 This cover fits fifth wheel trailers. 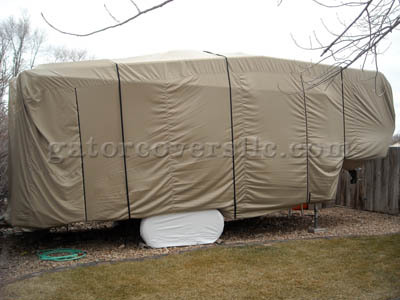 It is available in various lengths, and accomodates fifth-wheels that are up to 120" tall and 102" wide. The front and rear of the cover has elastic in the hem for a snug fit. Two 108" zippers are installed along the side wall for easy access. A 12-foot strap and buckle are attached beside each zipper. These straps go under the unit, side to side. Adjuster straps are attached at the front to help secure a snug fit. Four forty-foot adjustable tie-down straps are included. These straps wrap over and under the unit and snap shut with a quick-release buckle. A Reinforcement Kit is included. Use this kit to reinforce areas where excessive wear might occur.